Here you will find some interesting itineraries that will guide you through this wonderful city! There's no city in the world richer than Rome of water and fountains. Since the past 11 waterworks ensured water to the entire city. After the sack of the Goths the popes have restored and embellished dozens of monumental fountains celebrating their power and serving as baths and drinking troughs. Even today tourists can enjoy the fresh water coming out of the little fountains called "big noses" for the strange form of their taps. 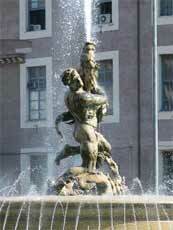 In Piazza della Repubblica there is one the most beautiful fountains of the modern Rome, the Fontana delle Naiadi. The square was originally called piazza Esedra for its form, which follows the line of the exedra of the magnificent Terme di Diocleziano, recently restored and reopened. Between the two palaces you can take via Nazionale, a very important street, where, at the number 194 you can one of the numerous expositions at the Palazzo delle Esposizioni. Often the building of a fountain was dictated more by the private needs of the popes than by the real needs of the citizens. It is the case of the Fontana del Mosè, in Piazza San Bernando, built at the end of the waterwork Felice, so called after pope Sisto V, felice Peretti. The work was made in order to serve the huge villa of the pope, which covered all the area between the Station Termini and the basilica Santa Maria Maggiore. The plastic figure of Moses is a clear celebration in honour of the pope. Walking down through Via Barberini you arrive at the homonymous square, characterized by the beautiful Fontana del Tritone, built around 1642 by Gian Lorenzo Bernini. The original sculpture, that decorated the Square before the palace of the noble family of Barberini, represents a triton breathing into a shell, declaring the glory of the family to the entire world. Until the XVIII Century the fountain was the scenery of a macabre rite. It was here that the cadavers were exposed waiting to be recognised. The bees, heraldic symbol of the Barberini, besides decorating the base of the Fontana del Tritone, are the central figures of a little but cute composition collocated in the corner between Square Barberini and Via Veneto, the Fontana delle Api. Bernini sculptured the three insects in 1644 to celebrate the 22nd anniversary of pope's Urbano VIII's pontificate. Maybe the fact that the fountain was ended before the anniversary had a bad influence on the happenings. The pope, in fact, died eight days before the celebration. From this point begins Via Veneto, the famous symbol of the Dolce Vita of the fifties and sixties. Along this charming street it is easy to meet some of the famous personalities of the show business, the politics and journalism. And of course the "paparazzi" too! Famous, in this street, are also the luxurious hotels and the well known caffè such as the Excelsior, the Majestic, the Ambasciatori, the Regina Palace, the Cafè de Paris, Doney and the Harry's bar. Even the Hard Rock Cafè has been recently opened in this street. The entire quarter was realized between the end of the '800 and the beginning of the '900 when the princes Boncompagni Ludovisi decided to lot the land around their wonderful villa. Only teh Casino dell'Aurora (in Via Boncompagni), decorated by Guercino and Caravaggio, has survived the division into lots. From Via del Tritone you can enter Via della Stamperia, that leads to the Fontana di Trevi, surely the most famous and spectacular fountain of Rome. Its fame has surely to be thankful also to the famous bath by night of Anita Eckberg in the movie of Federico Fellini, "La dolce Vita". The fountain rises at the end of the aqueduct built by a general of August, Agrippa, during the 19 b.C., in order to bring the water from the sources of Salone, 19 kilometres far from Rome, to the city. On the fountain it is illustrated the legend according to which a girl indicated to the thirsty troops of Agrippa the place where it was the spring. The aqueduct has worked up to today, providing water to the monumental fountains of the centre, from Piazza Navona to Piazza di Spagna. In front of the fountain you can admire the fassade of the church of Santi Vincenzo e Anastasio. This building has been for long the Papal Parish Church. In the inside there are the precordials of 22 dead popes: from Sisto V, dead in the 1590 to Leone XII, dead in 1903. This tradition was interrupted by Pio IX. Taking again Via della Stamperia e going on along Via del Nazareno you can esily arrive at Piazza di Spagna where, at the foot of the famous staircase of Trinità dei Monti you can admire the fontana della Barcaccia. This fountain is a masterwork of Bernini, who built it in 1629 with the help of his son, Gian Lorenzo. According to tradition this unusual boat half immersed has been made to order of Pope Urbano VIII in memory of a happening during the inundation of 1598, when a huge boat was stranded in the square. In reality the idea of its form is due to the geniality of its constructor and responds to technical exigencies. In this point the pressure of the water was very weak and the fountain had to be built a bit underground. From Piazza di Spagna begins Via del Babuino, famous for its shops of antiquary. This street is named after the little fountain placed against the church of Sant'Atanasio dei Greci. The big statue that rises above the granitic basin represents a laying Silenus that sarcastically grin to the Romans. Due to its ugliness Romans have compared it to a baboon, hence its name. The baboon is one of the Roman "speaking statues", that is, one of those statues in front of which students used to hang their political satires. In parallel of Via del Baduino there is Via Margutta, a picturesque street chosen by lots of Italian and strangers artists to locate their ateliers since '600. Even though it has undergone a decline, the street maintains lots of its original charm thanks to the numerous stores as the "Marmoraro", at the number 53, where they still work the marble with old and artisan instruments. The cute Fontanella degli artisti has been built by Pietro Lombardi in 1927 right to celebrate the peculiar artistry of this street. In fact the fountain represents the typical equipment used by artists, such as trestles, palettes and brushes. The lovers of vegetarian food and contemporary art can visit, in via Margutta 119, a very nice Restaurant, the Margutta Vegetariano RistorArte, where it is possible to enjoy a typical vegetarian menu admiring at the same time the shows of young artists. The Vicus Caprarius, called also “La Città dell’Acqua”, is an archaeological area in the quarter of Trevi, a few metres from the most popular fountain in the world: the Trevi Fountain. This spectacular area is a recent excavation of a imperial roman quarter. 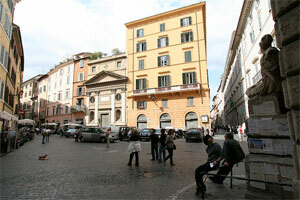 The area is situated under the famous Cinema Trevi. 8 metres underground, in a suggestive atmosphere, are visible different levels of an ancient district on the Caprarius Road (Vicus Caprarius). 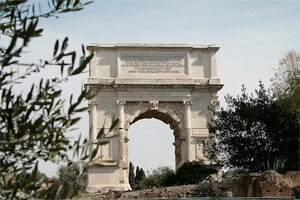 Architectural element born in Rome, the triumphal Arch was the greatest homage that the city devoted to its heroes. After a victorious battle the winner used to pass under a sacred door in order to celebrate their heroic exploits. Arches began to be erected in Rome already during the II Century b. C. but they widely increased during the Imperial Age when, more than the military heroes, they would celebrate the power of the Emperors and their families. This itinerary can begin in the area of the Velabro, at the limits of the Foro Boario, where it rises the great Arch of Giano, built during the IV century in honour of the emperor Costantino. This is the only supporting arch preserved in Rome. In the close church of San Giorgio al Velabro are kept the rests of the commemorative inscriptions that have been taken away in 1830 because erroneously considered extraneous of the original monument. According to tradition, in 1601, a young woman walking under the arch disappeared into a vortex suddenly opened under her feet. That is the reason why Romans would not pass very often under this arch. Right back this arch, placed against the church of San Giorgio al Velabro, there is the Arch of the Argentari. More than an arch, this was probably one of the monumental doors of the Foro Boario erected in 204 b. C. by bankers (argentari) and merchants of that place in honour of the emperor Settimo Severio and his family. The monument is almost 7 meters height. Walking through the Campidoglio you can enter the area of the Foro Romano where, by the Curia, you can admire the Arch of Settimio Severo. The Arch has been erected in 203 a. C. to celebrate the 10th anniversary of the reign of the emperor Settimio Severo when he came back from a victorious battle in Partia (the modern Iran and Iraq). 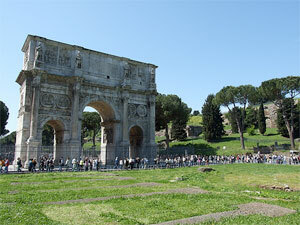 Still in the Foro Romano, walking through the Via Sacra direction Colosseo you can admire the Arch of Titus. Erected between '82 and 90 a. C. in honour of Titus, this is one of the most famous arches in Rome. Ordered by Domiziano, the Emperor's brother, this monument has been erected to celebrate the victorious exploit of Titus in Jerusalem. According to tradition Jewish people have never passed under the arch not to celebrate the man who has destroyed their temple. On the side towards the Colosseo you can still read the commemorative inscription, which recites: "Senatus Populusque Romanus divo Tito divi Vespasiai F(ilio) Vespasiano Augusto". The abbreviation S.P.Q.R., one of the symbol of Rome together with the Capitoline she wolf, derives from the expression Senatus Populusque Romanus, which, in the ancient Rome, opened any deliberations. Finally, in the square where it rises the Colosseo, there is the great Arch of Costantino, erected in honour of Costantino during the 10th year of his reign (315 a. C.) to celebrate his victory over Massenzio (312 a. C.). With its 25 meters, this is the tallest triumphal arch preserved in Rome. This is also a wonderful example of the traditional Roman practice according to which new monuments were built with samples of the existing ones. Here it is possible to find traces of constantinian works, besides sculptures and architectural elements coming from the monuments of Traiano, Adriano and Marco Aurelio. The arch was once and embellished by precious pictorial and metallic decorations. The dominant colours were the golden and the purple, the colours of the Empire. After many restorations, the arch has been completely restored in 1804. 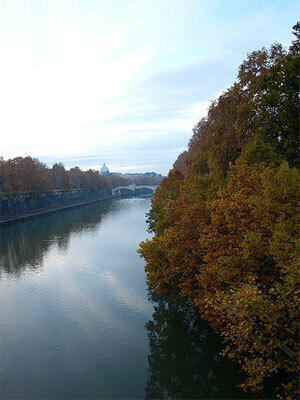 This itinerary follows the river Tevere, one of the most characteristic element of the Roman landscape. Up to the erection of the big walls the river was completely navigable. Once Romans used to take baths in their river and drink its water too. Nowadays it is still possible, from the end of the Spring till the beginning of the Autumn, to enjoy a fluvial navigation between two bridges, the Ponte del Foro Italico and Ponte Umberto I. 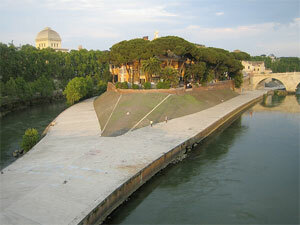 Our walk begins from the Tiberina Isle, which had a great importance in the birth and development of Rome. Around its banks, in fact, Romans have built their first settlements. One legend, originated from the particular ship-like form of the isle, tells about a ship that has run aground on the rocks in the middle of the river during an inundation, has been filled with sand, giving so birth to the isle. In the I century b. C. Romans have exploited this form modelling the sides of the isle and putting in its centre an enormous obelisk such a big mainmast. This "ship of stone" would also celebrate a miracle happened in front of the isle, when Romans, coming back with the ship from Epidauro, in Greece, were told by a snake, symbol of the god Esculapio (god of the medicine) to dedicate that isle to him. That's how, according to the legend, the isle has originally born as health resort. Still today the Hospital Fatebenefratelli is the biggest and most typical of the isle. 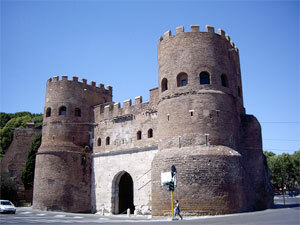 The isle is linked to the city by two bridges: the Cestio and the Fabricio, the oldest of Rome (62 b. C.). In the past it was named Bridge of the Jewish people because it linked the isle Tiberina with the Ghetto where would live the Jewish people. The Ghetto, has been instituted by pope Paolo IV Carafa in 1555 and abolished only in 1870, with the end of the temporal power of the Church. In an area of about three hectares, enclosed by height walls lived, in terrific hygienic conditions, more than 900 inhabitants. This quarter faces the Lungotevere Cenci and is characterized by the monumental building of the Synagogue, built in 1904. Back the Synagogue there is Via del Portico d'Ottavia, named after the ruins of the old porch erected during the 1 century after the order of Emperor Augustus for his sister. In the inside of the monument you can admire the church of Sant'Angelo in Pescheria, so called because of the market of fish which took place in this area from the Middle Age until the IXX century. This was one of the four churches where Jewish people were supposed to go in order to be converted to Christianity. Most of the Jewish people preferred going to the church with their ears filled with wax instead of paying a tax. Nowadays the Ghetto is one of the Roman quarters which best maintains the flavour, the smells and the aspect of the ancient Rome. Here you can visit one of the many little restaurants of the area and taste some of the most typical specialities of the Roman-Jewish dishes. One for all, the "Boccione", in Via Portico d'Ottavia, 1. Here you can find the typical sweets, bread and cakes cooked according the original recipes. From the church San Giorgio in Velabro, taking Via dei Foraggi, you get at the areas of the Foro Boario, once destined to the market of meat, and of the Velabro, once occupied by a marsh. According to the legend it was here that it has been founded the basket containing Remo and Romolo. Sons of Mars and Silvia Rea, the twins have been found and nursed by a wolf. That is why the Capitoline she wolf has become the symbol of the city. The most dominating monuments of the area are two famous temples of Vesta and of the Fortuna Virile. Close to the temple it rises the church of Santa Maria in Cosmedin of the IV century. Here, every Sunday at 10.30, it is possible to take part to the mess celebrated according the Greek-Orthodox rite. In the porch of the church, on the left, it is kept the famous Mouth of the Truth, a big circular stone representing the head of a fluvial divinity with its mouth widely open. According to a fascinating legend, this stone had the faculty to judge the honesty of people: those who said the false would have their head cut into the mouth. Even Audrey Hepburn and Gregory peck have been allured by the mysterious charm of this legend in the movie "Vacanze Romane". At this point our walk goes on towards Castel Sant'Angelo. You can take a walk or catch a bus. 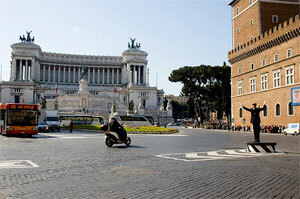 On foot you have to follow via dei Fori Imperiali till Piazza Venezia and than take Corso Vittorio Emanuele. Go straight to the river and then cross the bridge. Once there you'll face the Castle. Willed by Emperor Adriano, Castel Sant'Angelo has been erected during the II century as monumental tomb for him and his family. 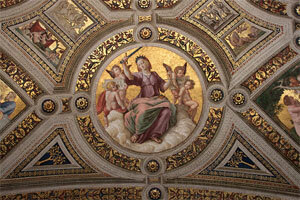 It is linked to the left bank by the Bridge Sant'Angelo, along which there are ten angels of marble. The statues have been decored by Bernini with the symbols of the Passion of Christ. In 403 Emperor Onorio included it into the walls of the city. Since the XIII century it has became a "dependence" of the Vatican. The link between the Castle and Saint Peter, a long covered hall, the famous Passetto di Borgo, was ordered by Pope Niccolò III. In the past the fortress has become famous as a prison. Here, among the others, have been imprisoned Cellini and the Earl of Cagliostro. The name of the Castle derives from a miraculous event happened in occasion of a pestilence in 590. During the procession ordered by Pope Gregorio Magno, the archangel Michele has appeared by the Mole Adriana to mean the end of the pestilence. The statue of the angel on the peak of the castle has been substituted six times. Leaving the Castle on your back and coasting the river you pass over the Palace of Justice and reach the Bridge Cavour. On the other side there is the Ara Pacis. The altar of the Peace represents the peace re-established in the Roman Empire after the victorious campaigns in France and Spain. In front of the monument you can admire the Mausoleum willed by August as tomb for him and his family. This monument, now felt into disuse, has served as vineyard, garden, arena, theatre, and, between 1905 and 1930, concert hall. At the end of the thirties, by the construction of the big square Augusto Imperatore, the monument has been isolated. Right on the square you can eat at the Restaurant Gusto, very elegant both in the food and in the atmosphere. 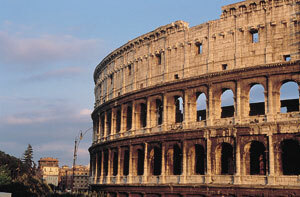 Following this itinerary you can discover a fascinating part of Rome which is usually left apart by most of the tourists. Even though monuments and works of art from the Middle Age are not very famous in Rome (most of them are hidden behind other buildings), they are surely worth a visit. Rome, during the Middle Age, was obviously much more little than it is today and it was extended around the river Tevere, important both as source of water and as river route. In the quarter Trastevere, along the right riverbank, you can visit some of the most important churches and buildings of the medieval period. Our walk can thus begin right from the isle Tiberina to be concluded in the very the heart of Trastevere, Piazza Santa Maria in Trastevere. On the isle you can still admire the rests of the Castle of Caetani, erected against the Tower of Pierleoni, which dates back to the X century. One of the historic event that made the tower famous dates back to 1087, when Matilde di Canossa and Pope Vittore III, escaping the persecution of Clemente II, took refuge right in the tower. Once the towers were the symbols of the power and importance of many aristocratic families. During the Renaissance most of them have been destroyed or attached to the residential palaces, the new symbols of the aristocracy. In the interior of the Church San Bartolomeo all'Isola, in front of the stairs of the presbytery, there is one of the most important medieval testimonial of the church, a puteal made of marble created from a fragment of a Roman column. The puteal dates back to the X century. On the left of the fassade of the church you can see the Romanic tower erected during the XII century. From the Isle Tiberina, crossing the bridge Cestio you arrive to Piazza in Piscinula, where you can visit Casa Mattei, an elegant group of houses dating back to 1400 erected for the Roman noble family and restored, during the Fascism, by Lorenzo Corrado Cesanelli. Some of the rooms of the ground were once occupied by the inn "della Sciacquetta. In the building on the corner with Via della Lungarina lived for a period the Roman poet Trilussa. From the Piazza in Piscinula you take Via Arco dei Tolomei, named after the medieval arch which characterizes it. The monument was erected for the noble family from Siena, the Tolomei, who has lived in this quarter since XIV century. From this street you turn to Via dei Salumi (which, as many streets of this quarter, has been named after the job of the storekeepers) from which it begins the picturesque Vicolo dell'Atleta. The Vicolo is so called because in 1849 they found the statue of the athlete Apoxyomemenos, as it can be inferred from the sweat and the dust mingled with the oil that covered the athlete's body before the wrestling. The sculpture, a Roman copy of a Greek original of Lisippo, is now kept in the Vatican Museums. At the number 14 of the Vicolo dell'Atleta you can admire a very nice thirteenth-century-building, with a loggia and ogival arches and some Hebraic inscriptions on the central column. This is the oldest Hebraic synagogue survived in this quarter that, in the Middle age, was widely populated by a colony of Roman Jewish. In this part of the city people used to dance the "saltarello", a typical dance of Ciociaria born in the XIV century. Every16 July, since 1535, this quarter celebrate the traditional "Festa de Noatri" ("Noatri" means, that is people from the quarter of Trastevere, opposed to the others, that is those who lived in other quarters) in honour of the Madonna del Carmine. The religious festivity is accompanied by a profane scenery made of concerts, competitions and various attractions which end with the traditional fireworks. Going back to Via dei Genovesi you can take Via di Santa Cecilia, which leads to the square where it rises the homonymous church. In front of the entrance of the Basilica di Santa Cecilia, on the corner with Piazza dei Mercanti, you can visit a beautiful example of a fourteenth-century-house. The church of Santa Cecilia, heavily altered through the centuries, keeps at its inside a wonderful gothic ciborium made by Arnolfo del Cambioin 1293 and the precious apsidal mosaics of the IX century. Here you can also admire the famous fresco of the Universal Judgement painted by Pietro Cavallini, the major Roman painter lived at the end of the Thirteenth century. Returning to Via dei Genovesi you get to Piazza Sonnino, where it is located one of the most famous medieval construction, the Torre degli Anguillara, known as Dante's house. The work of fortification, made up of an embattled fence braced by a tower, dates back to the XIII century. The fortification has been heavily restored during the XIX century. 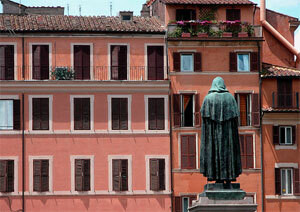 Since 1914 it is the see of the "Dante's House", a cultural institution which promotes the study of the poet. Close to the square there is the church of Crisogono, one of the great medieval churches of the Trastevere. In the apsid it is kept a mosaic of the XIII century erroneously attributed to Pietro Cavallini. The tower with its five floors has been built in 1120. Walking down all Via della Lungaretta you get arrive at the square where it rises the church of Santa Maria in Trastevere, one of the medieval jewels of Rome. In the apsid you can admire the famous mosaics of the coronation of the Virgin, realised in 1143, and of the Stories of the Virgin, made by Pietro Cavallini in the XIII century. On the left of the apsid there is the Chapel Altemps. Inside the chapel you can admire the Madonna della Clemenza of the VI century, one of the oldest image of the Virgin Mary. According to tradition, the erection of the church, in 38 a. C., is bound to a miraculous oil eruption, successively interpreted as an annunciation of Jesus' birth. On the miraculously healed place it has been erected in the IV century the first church of the city dedicated to the cult of the Virgin. Actually, more than by a miracle, the eruption was provoked by a natural oil spill. By night, this quarter, usually very quiet during the day, is visited by many Romans and foreigners in search of a nice place where to eat and have fun. All of the restaurants offer different solutions for all the tastes and all the pockets! Rome has been named "city of the obelisks". It boasts thirteen of them, more than any other city in the world. The first who have begun the tradition was Emperor Augustus, who carried two obelisks from Egypt. After him, Caligola erected one obelisk in Circus Massimo and ordered the construction of the big temple dedicated to Isis where have been found other five of them. 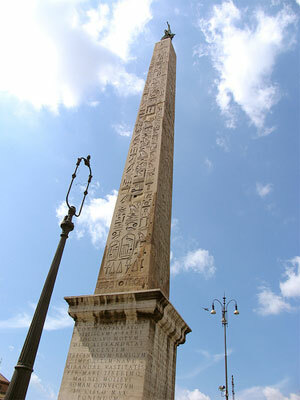 Till the end of the IV century emperors continued to erect obelisks. The oldest and tallest of the world has been ordered by Costanzo in 357. This obelisk is 38,18 meters height and dates back to the XV century b. C.
In the ancient Egypt the obelisks worked as simulacrums of the god of the sun Atum-Ra. The apex represented the centre of the power of the sun while the base represented the formless material that the sacred light of the sun turns to cosmos. In Rome they have lost their original meaning to symbolize the greatness of the Roman Empire, before, and of the papacy, after. Our itinerary in search of the obelisks, often placed by the popes at the centre of the squares or of important streets as visual point of reference, begins in Piazza Navona. At its centre it rises the great Fountain of the Rivers, projected by Gian Lorenzo Bernini as support of a huge obelisk. The monolith of red granite, realised in I century a. C. as imitation of the Egyptian ones to celebrate Domiziano, was probably destined to the temple of Isis. In 309 Emperor Massenzio decided to place it in the circus he himself had it built along Via Appia Antica. Since 1649 it remained, broken into 5 pieces, in the circus. When Pope Innocenzo X restored it and placed it at the centre of the fountain, where it is still today. Immediately after it has been placed over its apex the bronzed drill decorated with a dove carrying an olive branch, symbol of the Pope's family. The papal dove turned out to bear a great meaning because it dominates and spreads the truth of the Gospel in the four continents, allegorically represented by the four rivers places at the base. The Danube, the Ganges, the Nile, and the Rio of the Plate are symbolized by four fluvial divinities, easily recognisable from the elements that characterize them. The Nile is particularly interesting. This faun is covered with a veil to mean the mysterious origin of the river. From piazza Navona you can move towards piazza della Rotonda. To get here you have to cross Corso Rinascimento and take via dei Pastini, that leads you directly in front of the Pantheon. At the centre of the square there is a beautiful fountain dating back to 1575. At the centre of the basin it rises an obelisk of 6,43 meters coming from Egypt, where it had been erected for Ramses II in XIII century b. C. in the city of Heliopolis. Walking along the left side of the Pantheon you get to Piazza della Minerva, where it rises another beautiful monument of Bernini. Here you can admire a little obelisk of red granite, 5,47 metres height, built during the VI century b. C. by the Pharaoh Apries. After its find in 1655 Pope Alessandro VII Chigi decided to place it in the square in front of the church where it had been found, Piazza della Minerva. He charged Bernini who, for this monolith, had the idea of building an elephant-like base. Following the Egyptian symbolism, Bernini elected the elephant as symbol of divine knowledge embodied in the strong mind of the animal, as exemplified by the inscription of the basement: "It is necessary a strong mind to sustain the solid experience". From piazza della Minerva you can walk to Piazza Montecitorio. To get there you can take via Piè di Marmo till Via del Corso than follow it on your left till Piazza Montecitorio. Here, right in front of the Government seat, it rises the red obelisk of granite erected in the VI century by Pharaoh Psammetico II and carried to Rome by Augustus during the X century b. C.
Augustus used it as column for an enormous genial solar clock erected in Campo Marzio. This clock would project its shadow on a square in marble, indicating the time, the seasons, the zodiacal signs, and the years. This clock was not only a technological innovation. In fact its erection was strictly connected to the Ara Pacis, which was originally supposed to rise by the church of San Lorenzo in Lucina, and was regulated in order to project its shadow toward the altar in the Emperor's birthday. The obelisk has been placed in its present position by order of Pope Pio VI in 1794. At this point you can take again via del Corso and end this itinerary reaching Piazza del Popolo. On the wonderful scenery of the square it rises the 23,9 metres height obelisk, dating back to the XIV century b. C.
This is the first obelisk that has been carried to Rome to celebrate the victory of Augustus over Egypt. It was originally placed in the Circus Massimo. The present location, at the cross of three converging streets (via del Corso, via di Ripetta and via del Babuino) dates back to 1589 and is due to the indefatigable work of urbanism made by Pope Sisto V and his architect Domenico Fontana. The pope and his architect moved three other obelisks by three churches: san Pietro, Santa Maria Maggiore and san Giovanni in Laterano. The obelisk worked in the past to entertain Romans during their games. They used to bend a man and push him to walk from the obelisk to via del Corso. He could hardly do it because most of the times he was stopped by one of the many obstacles placed in the way. This itinerary begins from Piazza del Campidoglio, placed on the rise of the Colle Capitolino, since ever seat of divinity and power. Even thought this is the lowest and the most little of the seven hills, it was here that it was erected at the beginning of the VI century b. C. the most important temple of the ancient Rome, the Temple of Giove Capitolino. Where today it rises the church of Santa Maria in ara Coeli there was once the temple of Giunone Moneta. This was also the first mint of Rome. Moneta, the name of the goddess, has originated the present name for money, in Italian "moneta". During the Middle Age the hill has been partially abandoned. That is why it was called Monte Caprino ("capra" means goat in Italian). There were actually only goats and a little market. 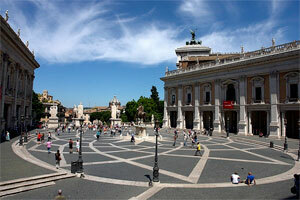 The square as real urbanist element was born only in 1538, when Pope Paul III charged Michelangelo to give it an order. Michelangelo planned the beautiful star-like form of the square, the façade of the Palace Senatorio, town hall of Rome since 1143, and the two palaces that surround the square, present seat of the Capitoline Museums, the oldest museums of the world. In the centre of the square you can admire the copy of the equestrian statue of Marco Aurelio, whose original copy is kept in the Museums. The fact that the statue has not been fused during the Middle Age, when it was normal to smelt metals, is just a case. The popes who owned it, in fact, thought that the statue represented Constantine, the first Christian Emperor. Piazza del Campidoglio is linked to the Terrazze del Vittoriano, or Altar of the Fatherland, through a way that has recently been opened to the public. From here you can enjoy a wonderful and wide view of the city. Inside the monument, erected in memory of Vittorio Emanuele II, first king of Italy, there is the Museum of the Risorgimento and the Sacrario delle Bandiere. At the foot of the hill there is Piazza Venezia, named after the monumental palace of Venetian origin, erected by order of Pope Paul II during the XV century. In 1929, when the palace became Government see, the square has been proclaimed Foro d'Italia, becoming the real heart of the city. One side of the square is dominated by the Altar of the Fatherland. The erection of the building unfortunately leaded to the destruction of the pre-existing medieval quarter where Michelangelo has lived till his death. From Piazza Venezia you can easily reach, passing from Via del Corso, Piazza Colonna, so called because of the great column of marble of the II century that celebrates the victorious campaigns of Marcus Aurelius over the Germanic populations. The column escaped destruction because during the Middle Age the little church of Sant'Andrea was built against it. From Piazza Colonna, passing in front of Palazzo Montecitorio, seat of the Italian parliament, you can walk to Piazza della Rotonda, so called because of the form of the Pantheon. To get there you have to walk along Via del Corso and than turn on your left to via del Seminario, that leads you directly to the square of the Pantheon. The Pantheon is the building of the ancient Rome best preserved and represents a real masterwork of architecture. The name Agrippa, still intelligible on the façade, refers to its first architect. But the existing monument differs to a great value from the first realisation. The present Pantheon has been re-projected by Emperor Adrian in the II century. The most astonishing characteristic of the building is its covering dome. This is the biggest dome of concrete ever realised. Its diameter of 43,30 metres is bigger than that of Saint Peter! The complete building is conceived as a perfect geometric figure: a sphere inserted in a cylinder. The diameter of the sphere coincides with the height of the cylinder. The dome ends with a big open eye of the diameter of 9 metres. From this gap enters the raining water that falls down exactly on the drains placed on the floor. Presently the Pantheon contains the tombs of the Italian kings besides that of Raffaello Sanzio, a very famous Italian painter. 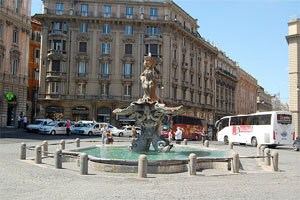 From this square you can easily walk to Piazza Navona. You just have to go via dei pastini till the end and than cross Corso del Rinascimento. 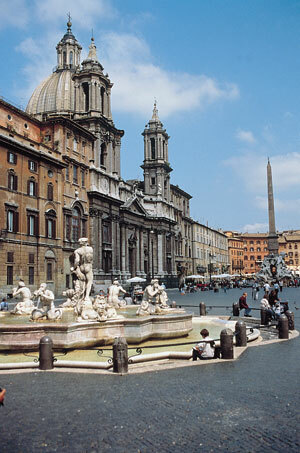 Straight on you'll meet Piazza Navona, one of the most extraordinarily best preserved square of Rome. The original form of the square, in fact, perfectly reproduces the perimeter of the old stadium of Domiziano, built in 86 a. C. for the athletic games. 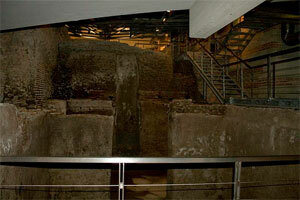 The rests of the old structure of the stadium is placed at 5-6 metres under the ground and are still visible under a modern palace in Piazza di Tor Sanguigna and in the underground passages of the church of Sant'Agnese in Agone. The proper name of the square, "Agone", is of Latin origin and means games. 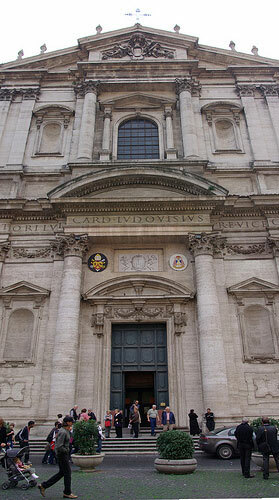 The church of Sant'Agnese in Agone rises in the place where, according to tradition, the twelve-year-old Agnese has been martyrized during the violent persecution of Diocleziano at the end of the III century. The form and scenic character of the Piazza Navona is due to the will of the family Pamphili who charged the greatest architects of their time to render it magnificent. The square was scenery of different games. One of the funniest one was the so called "lake", a game which took place in the square during the Summer. The square was inundated and people could enjoy some freshness. The custom has been abolished at the end of the 19th century for hygienic reasons. The square is surrounded by many cafés and ice-cream shops. During the day time it is visited by artists and intellectuals while by night it is visited by many young people and show men. 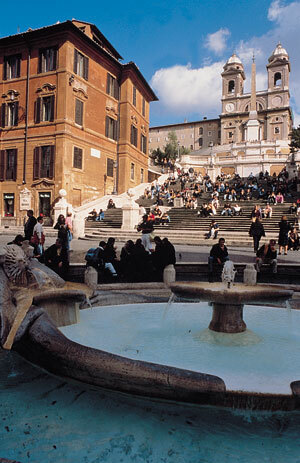 Our itinerary through the historical squares of Rome ends in Piazza di Spagna. The walk is pretty long but very pleasant. If you are too tired you can easily get there by metro or by bus. Otherwise you have to walk back to Via del Corso, for example going through via dei pastini. Once in Via del Corso turn on the left and follow the main street till Via Borgognona, which leads you directly to the square. If you love shopping you can take the next street, the famous Via Condotti, where you can admire the most beautiful shops of the centre. The square, characterized by a very original form that resembles a butterfly, has been since the 17th century meeting point for the travellers coming from all over Europe. This was in fact the arrival point of all the carriages. Since than the square has been invaded by many hotels, shops and cafés where artists, painters, writers and members of the reach families used to meet. This peculiar international atmosphere has been portrayed by Gabriele D'Annunzio at the end of the 19th century. The European atmosphere has certainly been underlined by the presence of two the French and the Spanish Embassies, from which it comes also the name of the square. At the beginning the square had been called Platea Trinitatis after the great staircase, Trinità dei Monti, that dominates it. Than the name has turned to Piazza di Spagna, for the part facing the Embassy of Spain, and Piazza Francia for the part facing the Embassy of France. The peak of the hill, where in the past rose wonderful villas, is dominated by the scenic façade of the church erected during the XVI century by order of the French kings in the place where San Francesco da Paola used to enjoy his peace and silence. In the past this place was totally isolated while in place of the present staircase there was a wood. The staircase made by Francesco de Santis in 1732 is made up of 138 stairs. Still the walk is not too hard because there are many places where you can stop and relax. Rome has been deeply influenced and shaped by the baroque art. The baroque is par excellence the style of the theatricality, wonder and astonishment that emotionally involves the spectator. During the XVII century the erection of palaces, squares, fountains and churches, that have completely invaded the city, gave Rome a new image which still nowadays distinguishes it from all the other cities of the world. Following this itinerary you can not escape to wonder at the most beautiful works of art made by two authentic genius of the art: Bernini and Borromini. Probably their greatness is due also to the rivalry that has characterized their relationship. 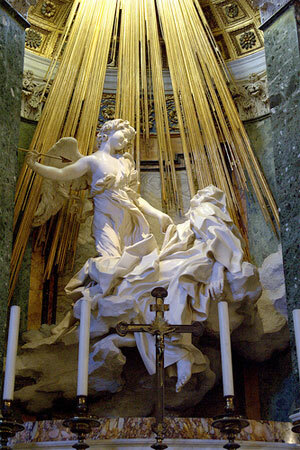 The itinerary begins from the church of Santa Maria della Vittoria, where you can admire a real work of art, the wonderful Ecstasy of Saint Teresa sculpted by Lorenzo Bernini. In Via del Quirinale you can admire the church of San Carlo alle Quattro Fontane, planned by Francesco Borromini. The peculiar form of the architectural elements that characterizes the church has been realised thanks the exclusive use of the stucco. Its ductility, in fact, has adapted itself very well to the fantastic plans of the architect. Though the limited dimensions, this church is a real work of art. If you go on along via del Quirinale, on the same side of the church of San Carlino, you will face the church of Sant'Andrea al Quirinale, one of Bernini's masterpiece. This church, defined the "pearl" of the baroque for the preciousness of the materials employed for its building, is known as the one that Borromini loved the most. He used to spend the last evenings of his life inside the church to enjoy the light that, filtered through the windows, was reflected on the marble walls and on the golden decorations of stucco. Going on along this street till its end you arrive at the Square of Quirinale, where you can admire two other Bernini's works, the loggia of the benedictions and the circular tower. Since its erection, the palace of the Quirinale was successively suburban residence, papal seat, Savoia's royal palace, and seat of the Presidency of the Republic. You can visit the palace every Sunday morning, from 8.30 till 12.30. Every Sunday afternoon at 16.00 you can see the solemn changing of the guard, accompanied by a band's concert. In front of the palace you can visit the Scuderie papali that, after the recent restoration made by the architect Aulenti, presently work as important show halls. From the café of the show hall you can enjoy one of the most beautiful view of the city. Coming down from the hill of the Quirinale alongVia della Dataria, crossing Via del Corso, it is worth a visit the church of Sant'Ignazio, even though there are no famous works of art. The huge ceiling, decorated with the fresco of the glorification of Sant'Ignazio in the sky by father Andrea Pozzo, is one of the last and most beautiful expression of the baroque painting. The false architectures creates an unbelievable sense of illusion of a neverending expanding space. Even bigger is the astonishment felt in front of the false dome. It is a trompe-l'oeil realised in prospective in order to be visible by the believers along the nave of the church. To best appreciate visual illusion you have to look at it from the disk of porphiry placed in the centre of the nave. Before going on, you should visit the little but beautiful square in front of the church. In 1727 Filippo Raguzzino, the architect who planned the buildings in movement, has been criticized for the form "chest of drawers- like" (a typical piece of furniture of that time) of the square. Nowadays we can enjoy it as one of the best construction of the baroque art. Via dei Bureaux, which is right back of the square, has been named after the French offices that characterize the street. If you take via del Seminario, right back of the Pantheon, and walk on your left, you arrive at Piazza Sant'Eustachio. Here you can admire the dome of the church of Sant'Ivo alla Sapienza, a Borromini's masterpiece. 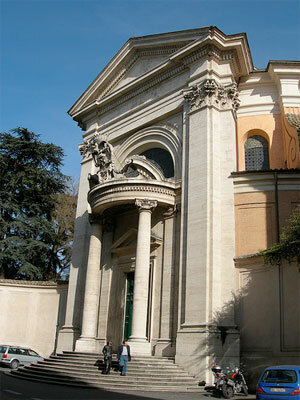 The church has been conceived as chapel of the University of Rome, instituted in 1303 by Bonifacio VIII. The original seat was in Trastevere and only in the middle of the Fifteenth century it has been moved to the area of Sant'Ivo. The building has been the seat of the University La Sapienza till 1935, when it has been moved to the Città Universitaria. The first to be charged to erect the chapel was Gian Lorenzo Bernini, who did not appreciate the work and assigned it to Borromini, who has built a wonderful and extraordinary structure. The original hexagon-plan of the building reproduces, schematized, a bee, symbol of the family who has ordered the work, the Barberini. Extraordinary is also the spiral dome ending with a flaming crown. The crown is Saint Ivo's symbol, saint patron of the lawyers. Saint Ivo was known as the "lawyer of the poor" because he defended them without pretending money. The lantern of the dome resembles the valve of a mollusc collected by Borromonini. This would also explain the source of his inspiration in planning the form, the richness and the complexity of the long dome. After a visit in Piazza Navona, that you can easily reach just crossing Corso Rinascimento, the itinerary through the baroque can not but end at the Vatican, where Bernini has left various important signs of his talent. You can get there both on walk and by bus. If you want to walk you have to take back, from Piazza Navona, Corso Rinascimento, turn on your right and go on till Corso Vittorio Emanuele. Once here you have to turn on your right and go always straight till the river. Once you'll have crossed the river, if you go straight on, you'll arrive at Via della Conciliazione. Than turn on your left. After some meters you'll face the Vatican. 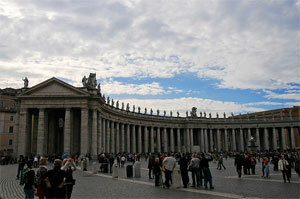 The Vatican offers many wonderful signs of the baroque art, starting from the spectacular colonnade of St. Peter's. The elliptical form, which symbolically represents the universal embrace of the church, is defined by a series of 284 columns placed in four rows. If you stop on one of the fires of the ellipse, marked by a disk of granit, it seems as if the colonnade was composed just by one row of columns! At the end of the right arm of the colonnade, two Swiss Guards guard the Royal Staircase. Through some architectural devices and exploiting to the best the little place he had, the artist could create the illusion of a staircase much bigger than it actually is. Bernini's geniality is fully enjoyable also inside the church. The huge space under the dome is fully occupied by the 29 meters height canopy, erected over the altar. The altar has been built right in the place where, according to tradition, has been buried Saint Peter. At the base of the bronze columns, realised smelting the roofing-tiles of the Pantheon, you can see the shields with Barberini's bees. If you look at them more attentively you will realise that the bees actually represent a series of expressions of sorrow on a woman's face during the delivery. Turning around the monument you can see seven different moments of the delivery, till the smiling face of the child. Bernini wanted to celebrate the human sufferings waiting for salvation. At the end of the apsid there is the See, the big bronze chair based on four enormous statues representing the four Doctors of the Church. The greatness of the See is astonishing. Consider that in order to build it they made use of more than 121 tons of bronze while the wing span of the dove of the Saint Spirit is 1,75 meters large. Bernini has built also the funeral monuments of Pope Urban VIII Barberini and Alexander VII Chigi. In the last one, placed in the left transept, the architect had originally sculpted the statue of the Truth completely naked. The Pope, considering it too scandalous, ordered to cover it with a dress in bronze. Under the monument there is the Door of the Death, characterized by a macabre skeleton with a hourglass in its hand, symbolizing the destiny of all humanity. During the Middle Age Rome was abandoned because of the move of the papacy to Avignon, in France. The absence of the Pope led to an economical crises that obliged people to leave the city. Rome soon became a mass of ruins where would pasture flocks of sheep and cattle. But after 1484, when Pope Martin V restored the apostolic see in Rome, the city underwent a rebirth that, at the end of XV century, led it to be again the great capital of the past. This itinerary begins from the Vatican Museums, where you can visit the Sistine Chapel, one of the most famous and visited monument of the world. The chapel is the most emblematic example of the papal patronage during the Renaissance. It has been decorated by the most famous painters of the time, such as Perugino, Ghirlandaio, Luca Signorelli, Botticelli, and Cosimo Rosselli. 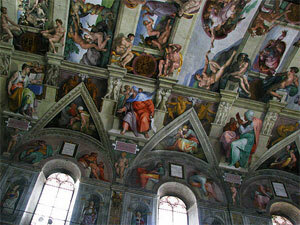 During the XVI century the chapel has been decorated also by Michelangelo. Between 1508 and 1512 the great artist painted the extraordinary frescos of the vault, while between 1534 and 1541 he painted the wall of the altar with the very famous Last Judgement. Most of the four hundred characters of the painting are naked and lots of them are characters of the time of Michelangelo. In Minosse, for example, painted with a snake around his sides biting his testicles, we recognize Biagio da Cesena, the Pope's Master of Cerimonies, while St Sebastian has the artist's face. When Michelangelo was still living most of his naked characters have been partly covered by Daniele Volterra, called the "braghettone". The restoration of the frescos of the Sistine Chapel ended in 1999. From the Museums, where you can also visit Raffaello's rooms, you can easily get to Piazza Saint Peter. The square is dominated by the biggest church of the world, Saint Peter's Dome. The dome and the plant of the Renaissance church have been planned by Michelangelo. The basilica has been erected over the old pre-existing church after order of the architect of the Pope, Donato Bramante, who ordered the destruction of the old church. 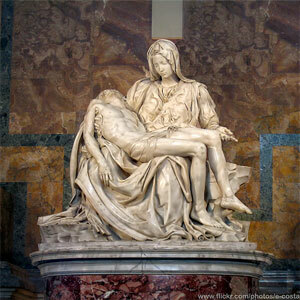 In the right aisle of the first chapel you can admire the wonderful Michelangelo's sculpture, the Pietà. This is the only work that carries the signature of its artist. According to tradition, Michelangelo, angry because no one knew he was the artist of the statue, decided to carve his name on the sash round the Virgin's breast. Our discovery of the Renaissance Rome continues with the nearby of Piazza Navona, where you can visit the quarter Parioni. You can easily walk there just following Via della Conciliazione till the river. Once you've crossed the bridge go on along Corso Vittorio Emanuele till you meet, on your left, the square where it rises the Chiesa Nuova. In the area between this church and Piazza Navona you can feel the real spirit of the Renaissance. First of all you should visit the wonderful church of Santa Maria della Pace with its baroque façade made by Pietro da Cortona. Inside the church you can admire the frescos of Peruzzi and Raffaello. The cloister is a wonderful example of Renaissance architecture, besides being the first work made in Rome by Bramante. But if you really want to experience a full immersion into the Renaissance atmosphere you just have to wander in this quarter, among Piazza del Fico, Via di Parione, Via del Governo Vecchio, Via di Monte Giordano, and Via dei Coronari, famous for its antique shops. Along those alleys you can admire the beautiful façades of the palaces and discover surprising, precious and fascinating courts. You should visit this quarter by night. Filled with people, this is one of the liveliest of the city. You can also meet many typical restaurants and delicious pizzerias. In piazza Pasquino there is the statue of Pasquino, one of the six "speaking statues" where Romans and poets used to hang satiric sentences against the Institutions of power. Those famous sentences are known as "Pasquinate". On the other side of Corso Vittorio Emanuele there is the quarter Regola, where you can admire other Renaissance streets, such as Via di Montserrato, named after the Spanish sanctuary of Montserrat, and characterized by many beautiful palaces erected between the fifteenth and the sixteenth century. You can visit the palace at number 117, visited, during the Renaissance, by prostitutes. When the palace has been restored in 1870, its owner, being criticized for the modernity of the façade, decided to carve on the architrave this sentence: "Trahit sua quemque voluptas" ("every one is moved by his own pleasure"). Another beautiful street to visit is Via del Pellegrino. Here you can admire some beautiful façades of palaces painted during the seventeenth century. At the end of the street, on the right, there is a blind alley that leads to a picturesque court, the Archetto degli Acetari, reproduced in various paintings. One of the most important palace of this quarter is the wonderful Palace of Chancery, placed in Piazza della Cancelleria. This imposing building has been erected in the sixteenth century by Cardinal Raffaele Riario who could build it with the money won at the game of dice. Campo de' Fiori, with its local market and the statue of Giordano Bruno, is surely one of the most characteristic square of Rome. The statue has been sculpted by Ettore Ferrari in 1887 in honour of the Dominican philosopher, burned alive in 1600 for heresy (he agreed with Copernicus's heliocentric theory. By night this square is one of the favourite place visited by young people. From this square you can easily reach Piazza Farnese just taking Via de' Baullari. The aquare is named after the great Palace Farnese, built by Antonio Sangallo for Cardinal Alessandro Farnese, who became Pope Paul III in 1534. The work has been ended by Michelangelo. Since 1871 the building is seat of the French Embassy. If the French allow you, it is really worth a visit inside the building, where you can see the Gallery of Carracci and the hall of Fasti Farnesiani, frescoed by Salviati. The palace has been named the Dice after its original form. Crossing the square you find the most beautiful street of this quarter, Via Giulia. This street was named after Pope Julius II, who elected it and had it restored by Bramante in 1500 in order to place here the most important directional buildings. Unfortunately the ambitious plan has not been fulfilled. Nowadays you can only see some great block of marble, destined for the base of the façade of the Court House. Those blocks have been named by Romans the "sofas of Via Giulia". 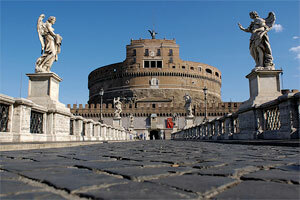 In this street there is also the Farnese overbridge, a big arch that offers you a romantic view of the street. This arch has been erected in 1603 in order to link Palace Farnese with some opposite palaces. In this stretch of the street have also been celebrated some traditional Roman festivities such as the "palio de berberi e cavalli". Our itinerary goes on to the other side of the river. Right back the palace Farnese there is the bridge Ponte Sisto, whose origins date back to the II century a. C. The present bridge, that underwent a work of restoration up to 1999, has been erected in the second half of the XVI century on the foundations of the old one by Pope Sisto IV della Rovere. In occasion of the Jubilee in 1475 the bridge had the function to link directly the quarter of Trastevere with the rest of the city. In Trastevere, if you pass down Porta Settimia, from Piazza Trilussa you get to Via della Lungara. Erected in the III century in honour of Emperor Settimio Severo, the gate has been lately incorporated by the wall of Aureliano and extended in the XV century. Its present appearance is due to Pope Pio VI. 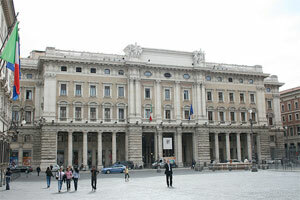 The renaissance itinerary can not but end with Villa Chigi, called the Farnesina, in Via della Lungara 230. This palace has been erected at the beginning of the XV century as suburban residence for the rich banker from Siena Agostino Chigi. The villa is an extraordinary place. Inside you can admire some beautiful frescos painted by Peruzzi, Sebastiano del Piombo, Sodoma, and Raffaello. The palace is famous also for the rich banquets organized by the owner. Along Via della Lungara there is the prison Regina Coeli, instituted at the end of the XIX century and named after the pre-existing church of Santa Maria Regina Coeli. According to tradition "there are no Romans who has not entered the prison". Visit the Vatican Museums without queueing up! With one ticket you can have access to: Sistine Chapel, Pinacoteca (picture gallery), Raphael Stanze, Gregorian Egyptian Museum, Gregorian Etruscan Museum, Classical Antiquities, Pio Christian Museum, Lower Galleries, Collection of Modern Religious Art, Missionary-Ethnological Museum, Gregorian Holy Museum, Gregorian Profane Museum, Vatican Historical Museum.